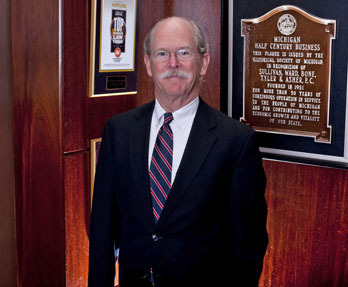 John M. Simmerer is a trial attorney with more than 36 years of experience litigating insurance matters in Michigan. He is a former licensed Michigan Insurance Solicitor and is particularly qualified in insurance coverage disputes and insurance agents' errors and omissions (E&O) law. John advises and represents clients in litigation relating to a wide variety of insurance defense matters, including insurance agents E&O defense, coverage and insurance contract interpretation, as well as matters involving premises liability, auto negligence/no-fault, construction and product liability. He also handles cases of professional liability for architects, engineers and attorneys. John is a former petty officer with the U.S. Navy Seabees. He is a member of the American Bar Association, the Michigan Bar Association and the Macomb County Bar Association. He was selected in 2010 as a “Top Lawyer” by Dbusiness magazine and he was listed in “Detroit’s Best Lawyers,” 2013 Edition. John also has been awarded and maintains the Martindale AV rating, the highest rating available.